The genus Rhodococcus belongs to the Corynebacterinae, a group of mycolic acid-containing organisms within the Actinomycetales. The suborder currently includes the genera Tsukamurella, Dietzia, Corynebacterium, William-sia, Turicella, Mycobacterium, Gordonia, Skermania, Rhodococcus, and Nocar-dia (Gürtler et al. 2004). Rhodococci are aerobic, Gram-positive, nonmotile, asporogenous, GC-rich, nocardioform bacteria, of which some are able to exhibit mycelial growth with fragmentation into rod-shaped or coccoid elements. Rhodococci are common throughout nature and have been isolated from very diverse habitats, such as soils, rocks, boreholes, groundwater, marine sediments, animal dung, insect guts, and diseased animals and plants (Bell et al. 1998). 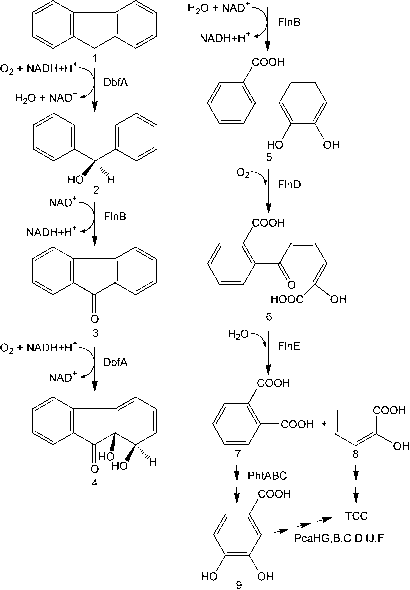 This widespread occurrence reflects the great ecological and biotechnological importance of rhodococci because of their unique enzymatic capabilities and extensive catabolic diversity, such as biodegradation of hydrophobic natural compounds and xenobiotics, including polychlori-nated biphenyls. These characteristic metabolic functions are often encoded by genes on plasmids (van der Geize and Dijkhuizen 2004; Larkin et al. 2005; Fetzner et al., in this volume). Besides the metabolically useful rhodococci, there are two pathogenic species, R. equi and R. fascians. The animal pathogen R. equi causes primarily chronic bronchopneumonia and enteritis in foals. Since 1967, it has also been reported to infect immunocompromised humans, which makes it an emerging threat in the current era of HIV infection (Weinstock and Brown 2002). The virulence genes of R. equi, including the virulence-associated protein genes, are located on a circular plasmid pREAT701 within a PAI of 27.5 kb (Takai et al. 2000). 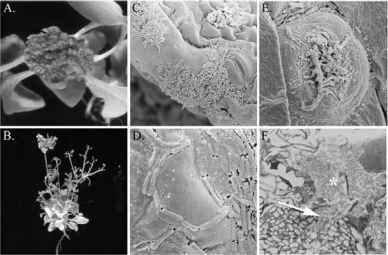 R. fascians is a phytopathogen that causes leafy galls on a broad range of dicotyledonous as well as monocotyledonous plants through secretion of signal molecules that interfere with the hormone balance and, hence, with the developmental pathways of the host (Goethals et al. 2001; Vereecke et al. 2002a) (Fig. 1). R.fascians initially colonizes the plant epiphytically without causing disease. Although invasion through stomata and wounds has been observed, upon an unknown trigger the bacteria penetrate the plant tissue by locally destroying the underlying cells forming ingression sites (Fig. 1). Whereas the epiphytic population directs the onset of symptom development (Cornelis et al. 2001), the endophytic population controls the sustainability of the disease. The continuous presence of metabolically active bacteria is required for maintenance of the leafy gall structure (Vereecke et al. 2000). Genes implicated in leafy gall formation are located on a large conjugative linear plasmid (Crespi et al. 1992) that does not contain genes essential for bacterial growth because it can be lost without any obvious effect on bacterial viability (Crespi et al. 1992). The sequence of the linear plasmid of R. fascians strain D188, designated pFiD188 (for fasciation induction), is currently being determined. As estimated by pulsed-field electrophoresis and restriction analysis (Pisabarro et al. 1998) the plasmid size is 200 kb, of which 175 kb has already been sequenced (unpublished data). Below, we will glance at the structure and composition of pFiD188.